As many expected to happen, WBO WBO World champion Oleksandr Usyk (13-0, 11 KOs) toyed with the past his prime former 200 lb. champion Marco Huck (40-5-1, 27 KOs) in defeating him by a 10th round TKO on Saturday night at the Max-Schmeling-Halle in Berlin, Germany. This was the first fight of the World Boxing Super Series. Usyk, the No.1 seed, showed that he’s going to be hard to beat with his boxing and slugging that he was doing all night against Huck. The fight was stopped at 2:18 of round 10. Huck had a point deducted in round 8 after hitting Usyk after he’d fallen down. It was pretty blatant. 2012 Olympic gold medalist Usyk was pounding the living daylights out of the 32-year-old Huck in round 10 when the referee stopped the contest to save the German fighter from getting seriously hurt. Huck didn’t have much to say about the stoppage, considering the referee Robert Byrd did him a huge favor in stopping the fight. Huck was trapped against the ropes at the time of the stoppage. Usyk was unloading on the tired and badly bruised Huck. The German boxing fans weren’t too happy at seeing their fighter Huck stopped. There wasn’t much cheering at the end, and the fans had sour looks on their faces. The fans are used to seeing Huck win his fights. It’s still new experience for them to see Huck losing to guys like Usyk, Mairis Briedis and Krzystof Glowacki. Huck is no longer the best in the division. The fight didn’t have a lot of high points. 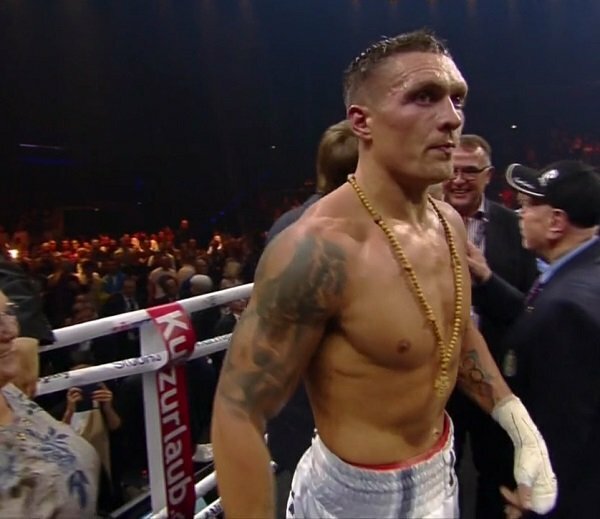 It was just the 30-year-old southpaw Usyk going about his business in pounding Huck at will with punches. At one time, Huck was considered the best fighter in the cruiserweight division. Tonight, he was a shell of his former self. But that much was obvious in Huck’s last fight in losing a 12 round unanimous decision defeat to Mairis Briedis last April in Germany. That was just as one-sided as tonight’s fight. It was smart for Huck to volunteer to fight in the World Boxing Super Series though, as it gave him another title shot that he clearly didn’t deserve. Huck might want to think about retirement. I don’t think he’s got enough left to go on another title run at his age. Huck isn’t old at only 32, but he looks older and his physique isn’t what it once was. More importantly, Huck isn’t able to attack his opponents like he used to. He gets tired quicker, and his power doesn’t seem to be as devastating as it once was. For some fighters, 32 is over-the-hill. I think that might be the case for Huck. It would be good for Huck to hang up the old gloves and save himself the indignity in being used as a trial horse by the young lions in the cruiserweight division. Huck had a good run. I doubt that Usyk will be able to stay on top of the cruiserweight division for nearly as long as Huck did. The win for Usyk moves him on to face the winner of the Briedis vs. Mike Perez fight, which takes place on September 30.